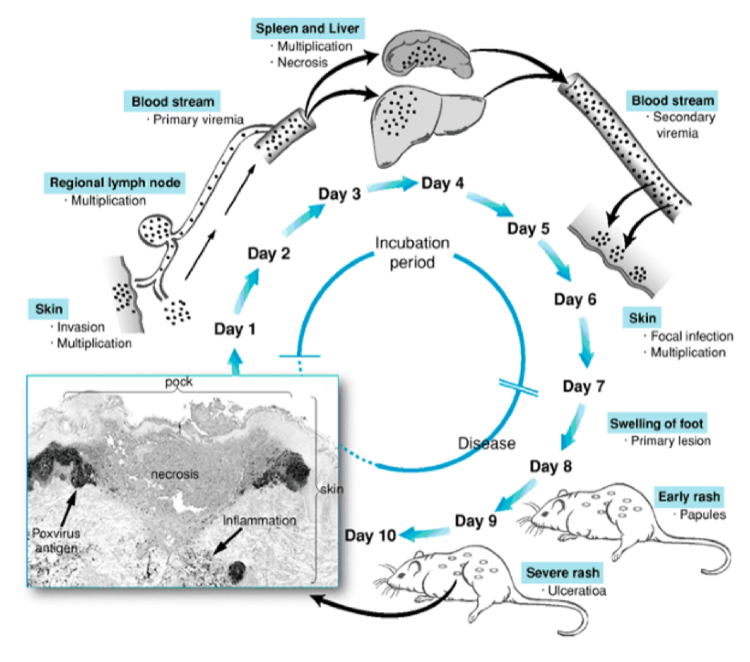 There’s a famous picture in Field’s Virology1 showing how ectromelia (mousepox virus, a model for smallpox) infects a new host, spreads within the mouse, and then is transmitted to a new host. The figure is below2 (click for a larger version). 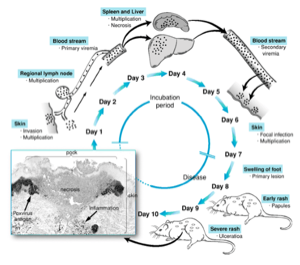 Simplified, ectromelia initially infects the skin through small cuts; it replicates at the site, then spreads through blood and lymph to organs (spleen, liver) where it replicates further. The progeny virus from this replication then spreads again through the blood, this time back to the skin, where it replicates once again (now vastly amplified from the initial infection) to form the classic “pock” lesions, which shed virus that can infect a new victim. It’s generally accepted that this is a common pattern of pathogenesis for many of the viruses that go systemic; not necessarily all viruses, because certainly some remain localized or only spread through, say, direct contact, but for something that spreads through the entire host, it should be a reasonably accurate model. Koszinowski has a habit of constructing very cool systems for analyzing his pet virus; sometimes so fancy that I wonder if he makes them a little baroque just because he can (and I know4 that he has occasionally been bitten by his elaborate systems). Here he used a Cre/lox recombination system, with the flox in the CMV and the Cre in the mouse under cell-specific promoters, so that the virus genome gets modified only when it replicates in the particular organ. Don’t worry about the details, the point is that the virus is tagged as soon as it replicates in a particular organ, so you can look at viruses throughout the whole mouse and identify whether their ancestors ever replicated in one particular organ. You can also work out timing of replication, and a few other things. The unexpected bottom line is that what happens in the liver, stays in the liver. 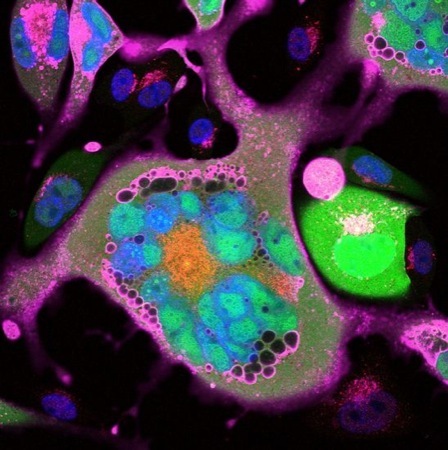 There is more MCMV in the liver than anywhere else in the body, but it’s a dead end; once it’s in the liver it doesn’t spread to other organs.5 Instead, the relatively small amount of virus that replicates in endothelial cells (and perhaps in the spleen) seems to be a major source for further spread within the body and for transmission. The results challenge the concept that organs that produce the bulk of infectious virus during acute infection necessarily also play a major role in dissemination. This shows how little we really know about what goes on in authentic viral infections. So much of our understanding of virology is based on tissue culture, but it’s harder than it looks to extrapolate a simple in vitro observation to the complicated interactions within the body, and it’s dangerous to extrapolate from one virus to another. Why does CMV replicate in the liver if it’s a dead end? Is this simply a matter of indifference to the virus (replicate anywhere you can and hope you’re in the right spot to spread) or is it doing something specific to modulate the host in some way? My bias is that this is something the virus is doing for a reason, but I don’t know what. Fenner F, Buller RM. Mousepox. In: Nathanson N, Ahmed R, Gonzalez-Scarano F, et al., eds. Viral Pathogenesis. Philadelphia: Lippincott-Raven; 1997:535-553.